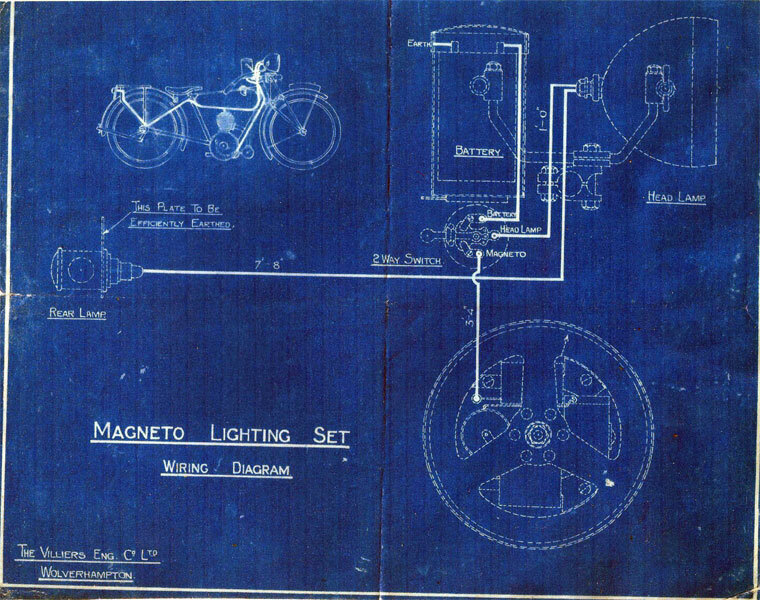 Blueprint for the Villiers Magneto Lighting Set, used by Hezekiah Close in the early 1920's. 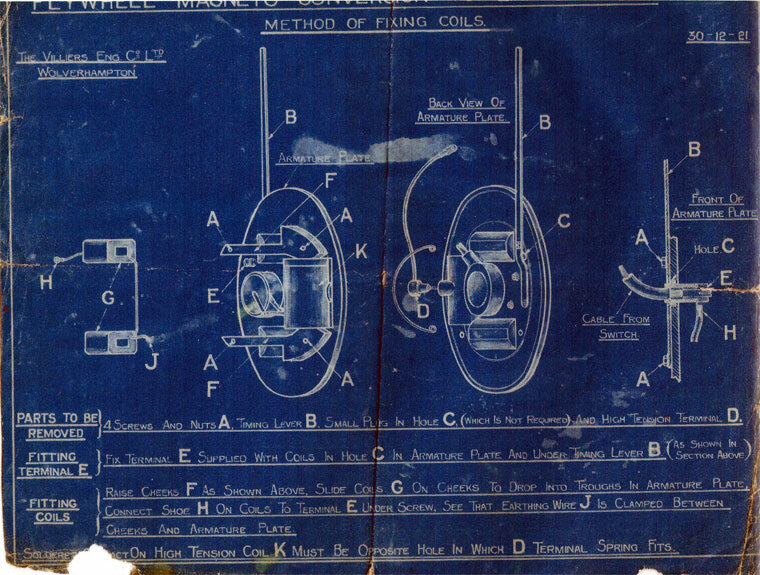 Villiers blueprint used by Hezekiah Close in the early 1920's. April 1936. 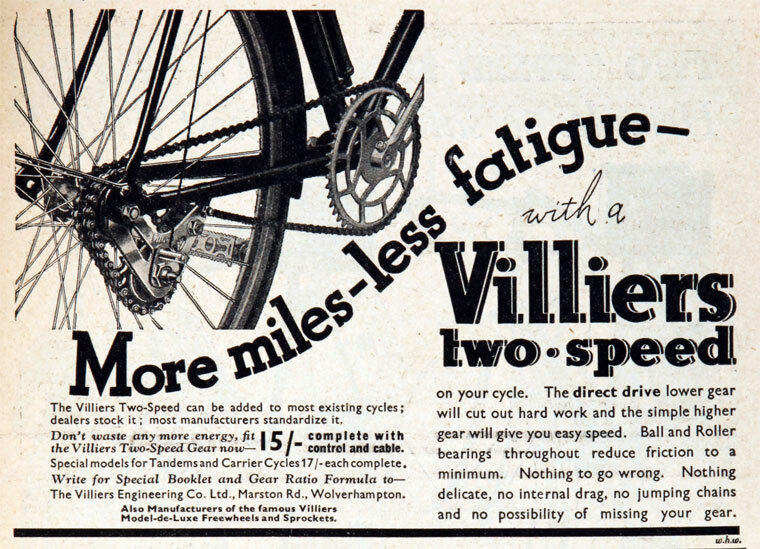 Two-speed cycle gear. 1939. 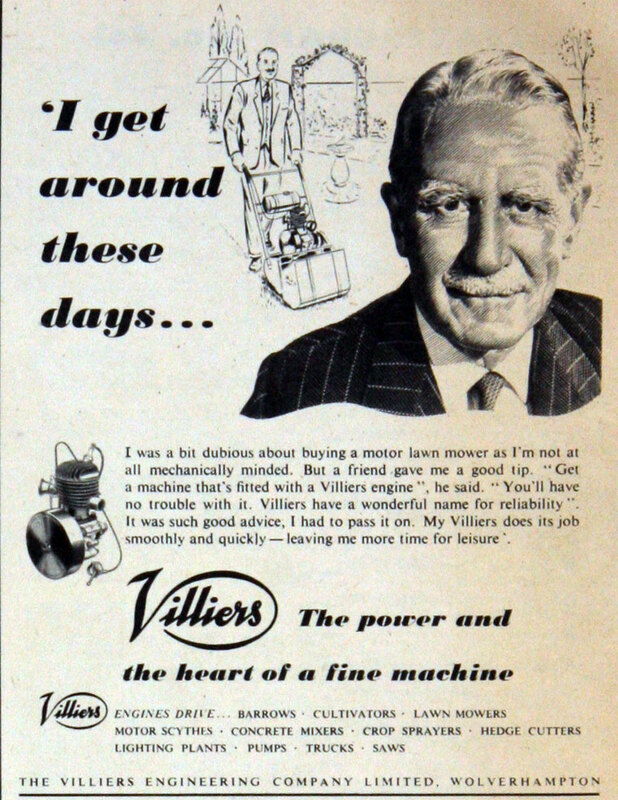 Villiers VXII. Aerograph Compressor. Mark c12-10-4, driving crane hoist. 1970. Type 444H / 444H2 Paraffin or Petrol. 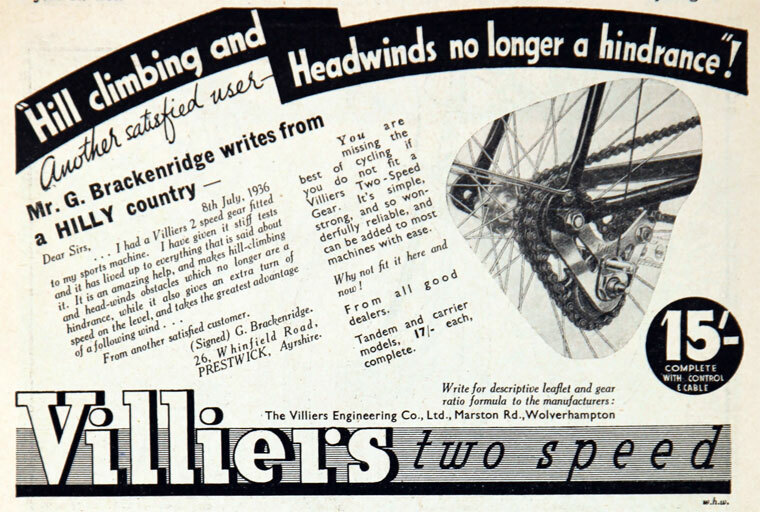 Villiers Engineering Co Ltd was a manufacturer of small engines for motorcycles and other uses, and cycle parts, based in Villiers Street, Wolverhampton. 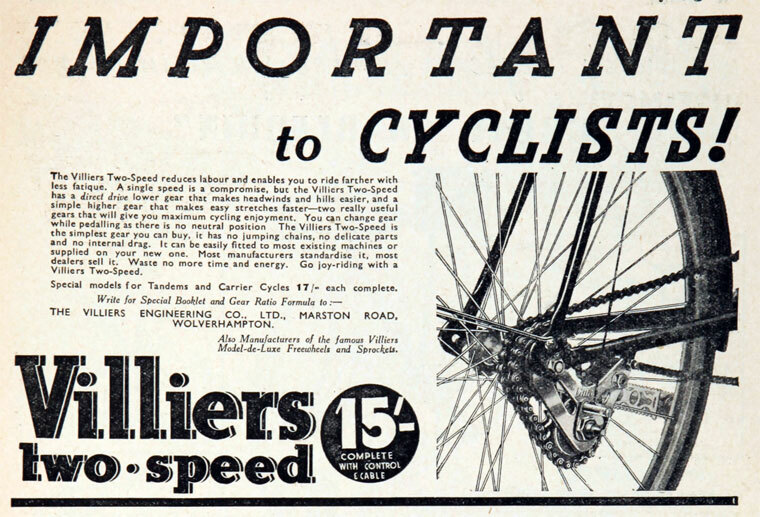 1880s John Marston's Sunbeam cycle had become extremely successful, by relying on high quality of production and finish. 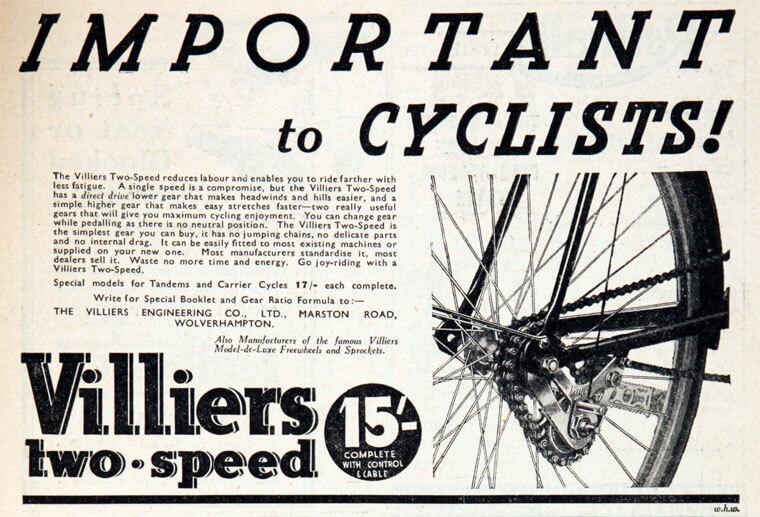 But Marston was dissatisfied with the pedals on his machines, which he bought in. 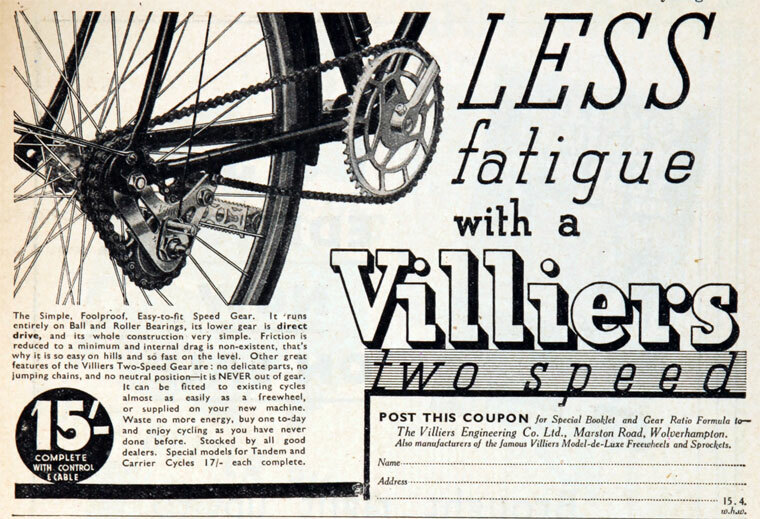 In 1890, he dispatched his son Charles Marston to the USA on a selling trip but included in his instructions that he must discuss pedal engineering with Pratt and Whitney in Hartford, Connecticut and come back with a high class pedal and the machinery for making it. 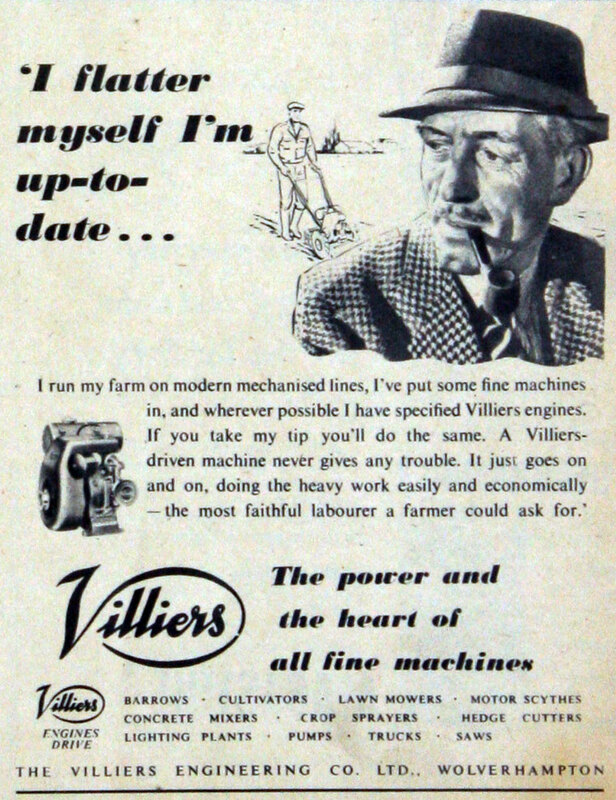 Charles has said that the Villiers Engineering Co was "the ultimate fruit" of his trip to the USA. He was impressed by the production system and the labour saving devices he saw there. He pointed out that "it was not possible to develop these at Sunbeamland, which had long been working on another plan, but it was possible to start them in a new factory". 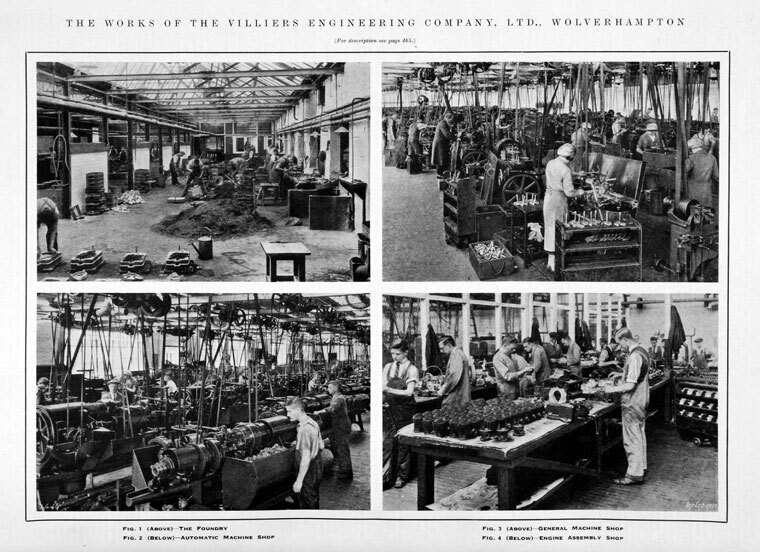 1898 As a result of the tour John Marston bought a small Japanning works in Villiers Street, Wolverhampton, that had belonged to Edward Bullivant. 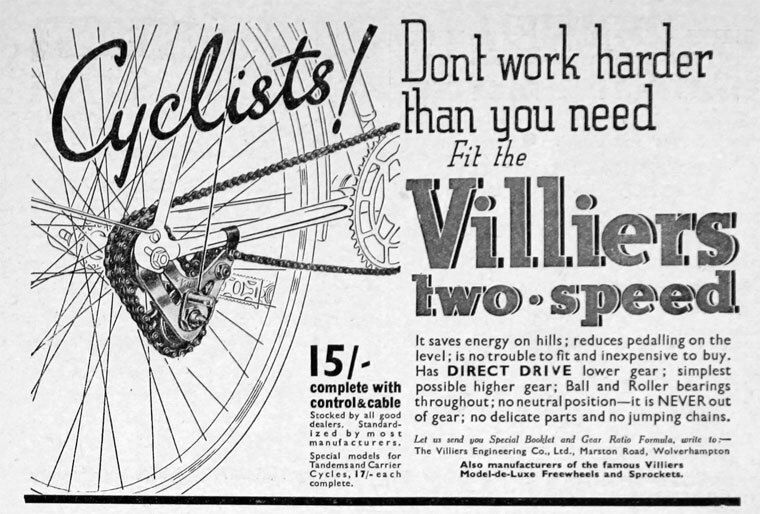 Under the direction of Charles, the new company made cycle parts for the Sunbeam cycle. 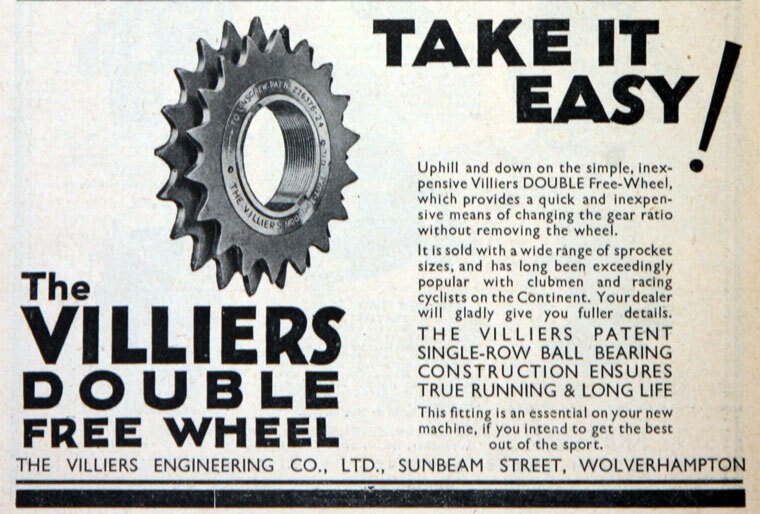 As the factory was producing more parts than Sunbeam required, Villiers also sold components to other manufacturers. 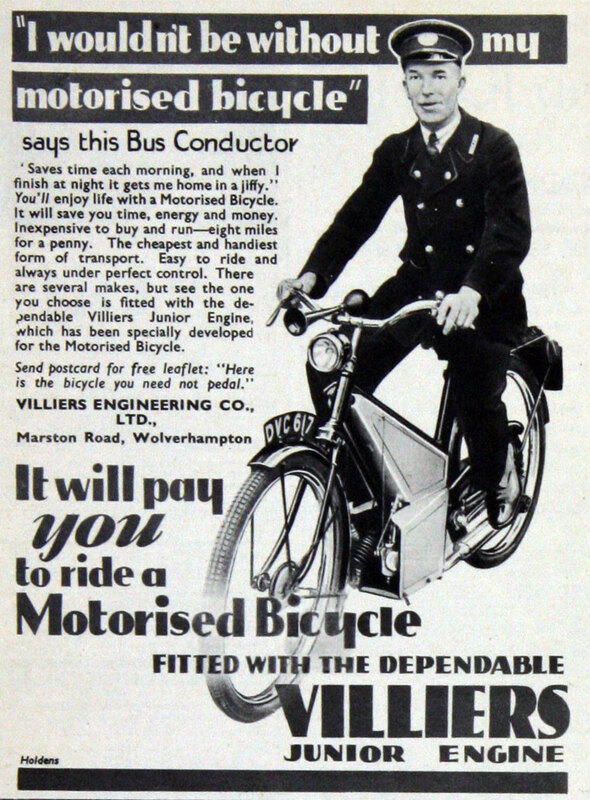 Frank Farrer, who was then the manager of Palmer Tyre's Coventry depot, was appointed as sole agent for the sale of the surplus pedals. 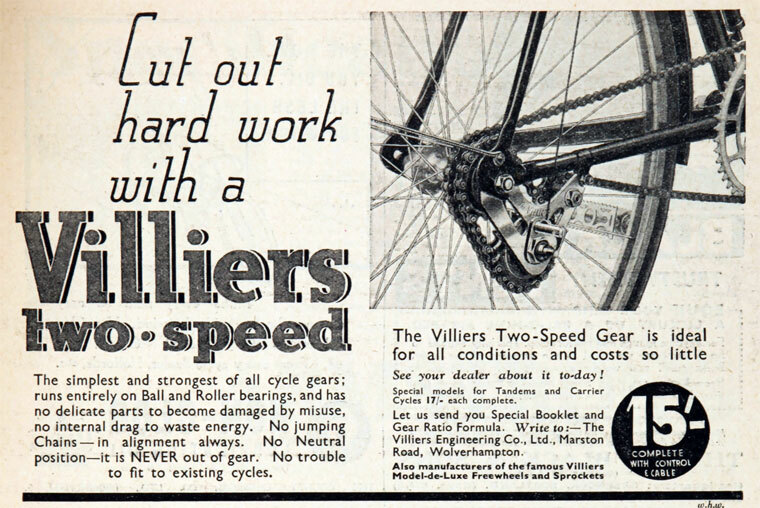 Farrer had many connections with the cycle trade, was a good engineer and a great salesman and was to become the driving force in Villiers. 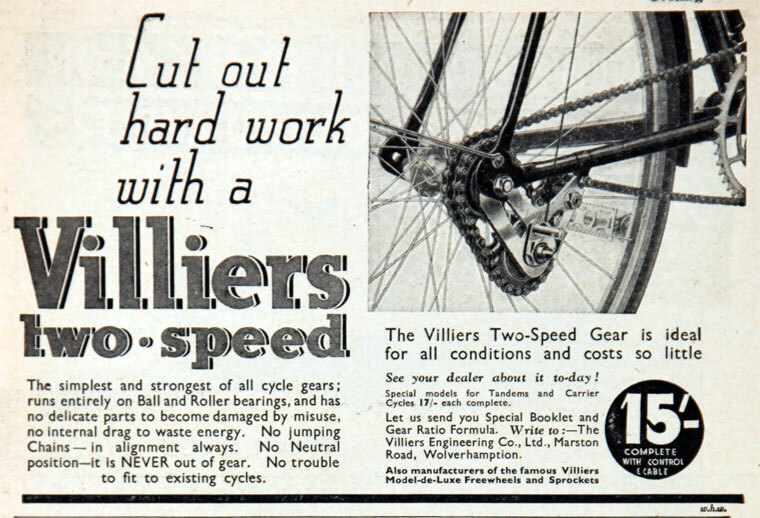 So successful was this move that Frank Farrer joined Villiers full-time in 1902; the factory employed 36 men. 1902 John Marston sold the company to his son Charles for £6,000 on a loan against future profits. 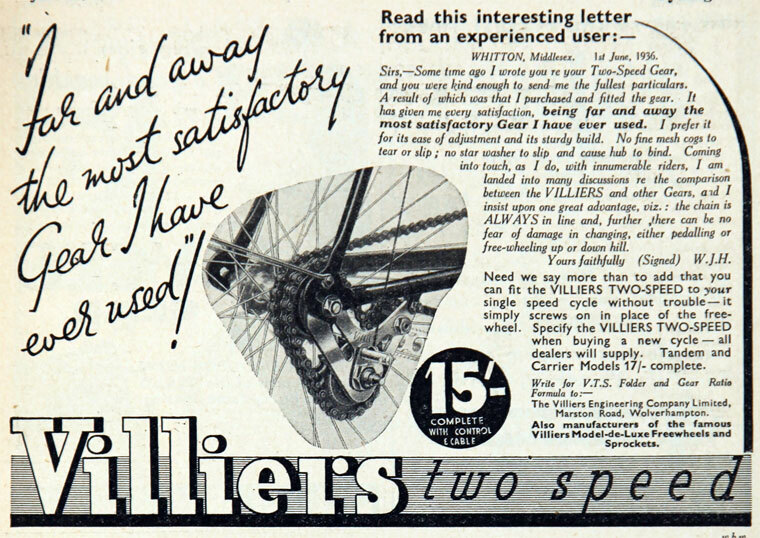 Secondly, it developed and patented the cycle free-wheel, which every cycle manufacturer required. 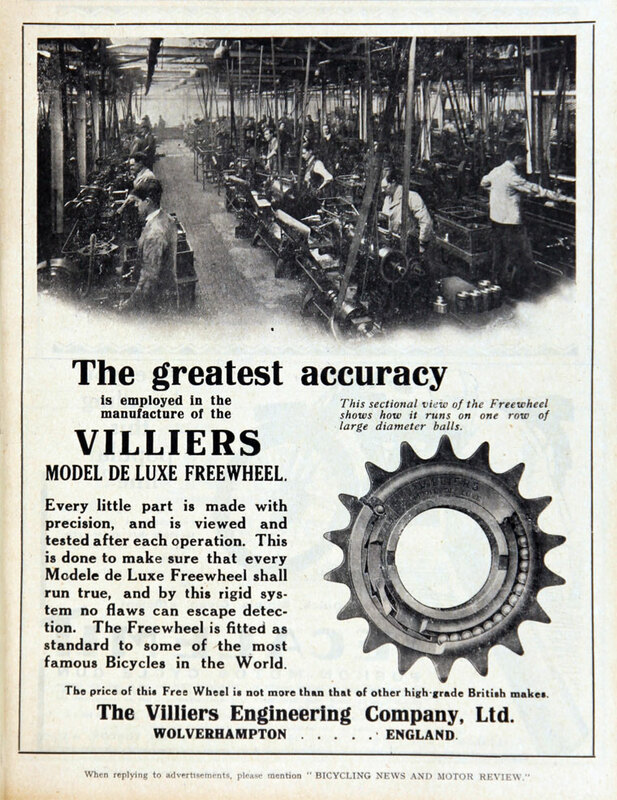 The production of free wheels reached its peak just after World War II, as the company produced 80,000 per week or 4 million per year. 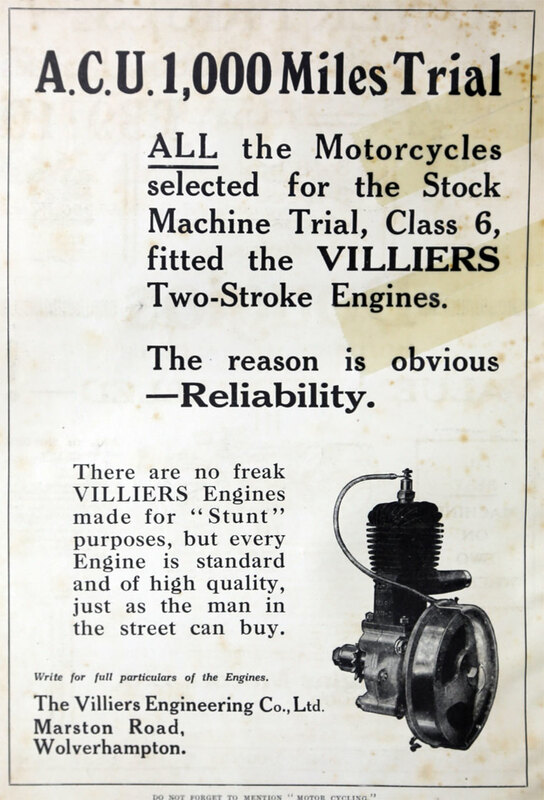 1912 Early in the year they introduced their first motor cycle engine, an inlet over exhaust 350cc four stroke with a built in two speed gearbox and clutch but it was considered too complex and was not a success. 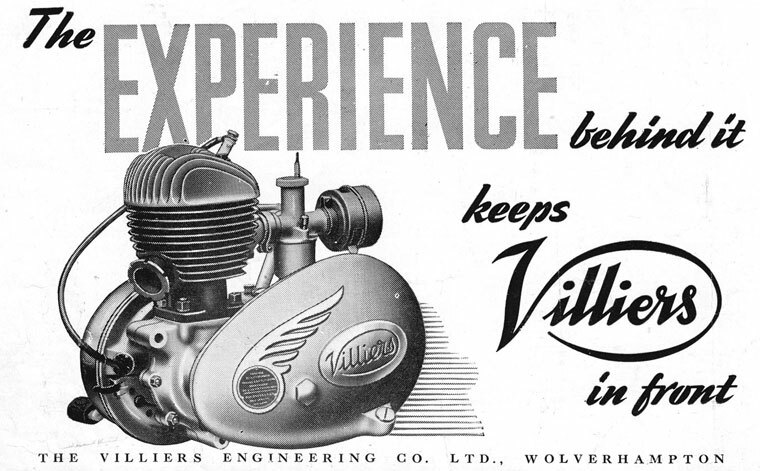 1912 At the end of the year they introduced their first two-stroke engine with a 269cc unit. This engine was designated the Mark I and given the code 'O'. 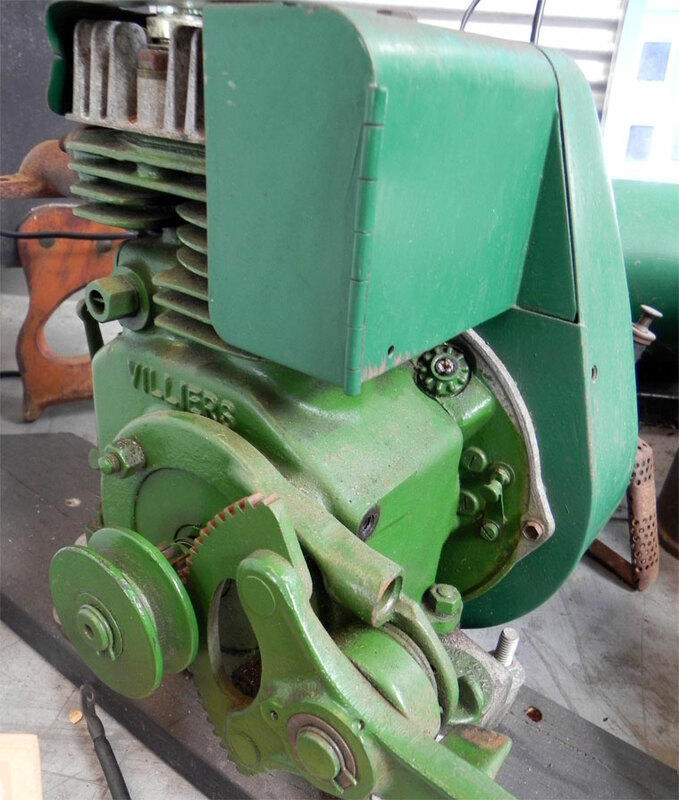 The cylinder had a fixed head and the bearings for the crankshaft and small end were made of phosphor-bronze while the big end a roller bearing. The piston was a deflector head type made in cast iron. The exhaust pipe and expansion box were made in aluminium. 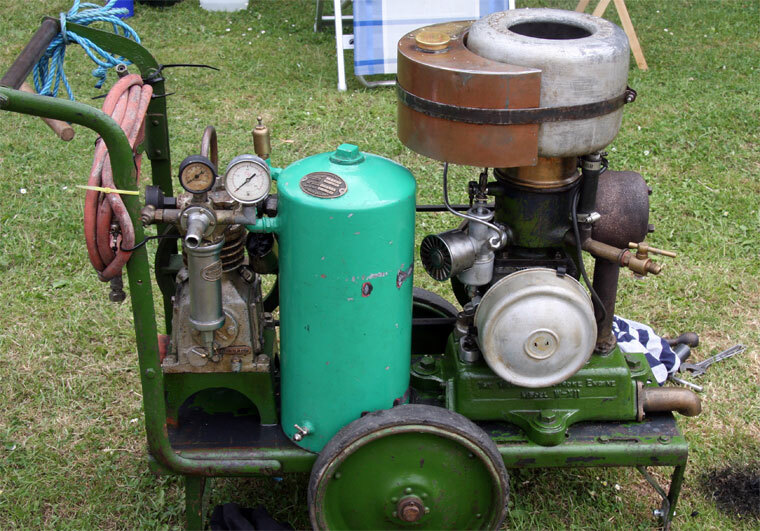 The lubrication system was by hand pump from the oil tank, which was built alongside the petrol tank. 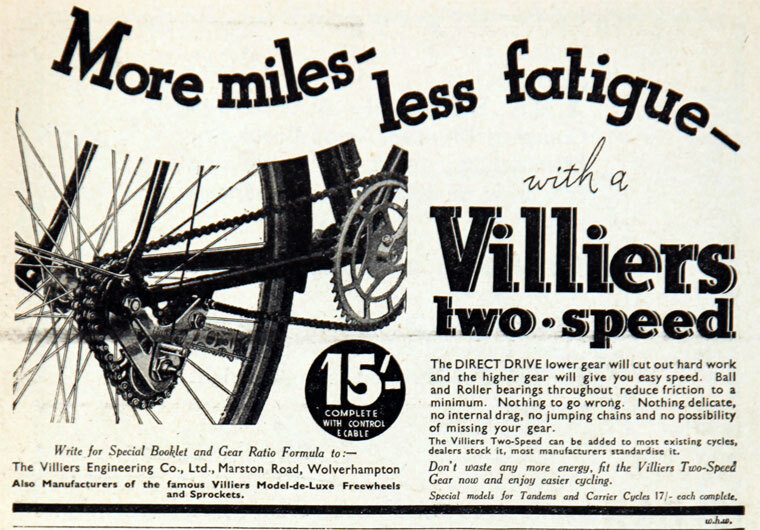 The oil was passed through a drilled front crankcase bolt into the crankcase where oil-ways fed it to the bearings. Surplus oil was splashed onto the walls where it was picked up by the incoming petrol vapour and taken to the upper cylinder. 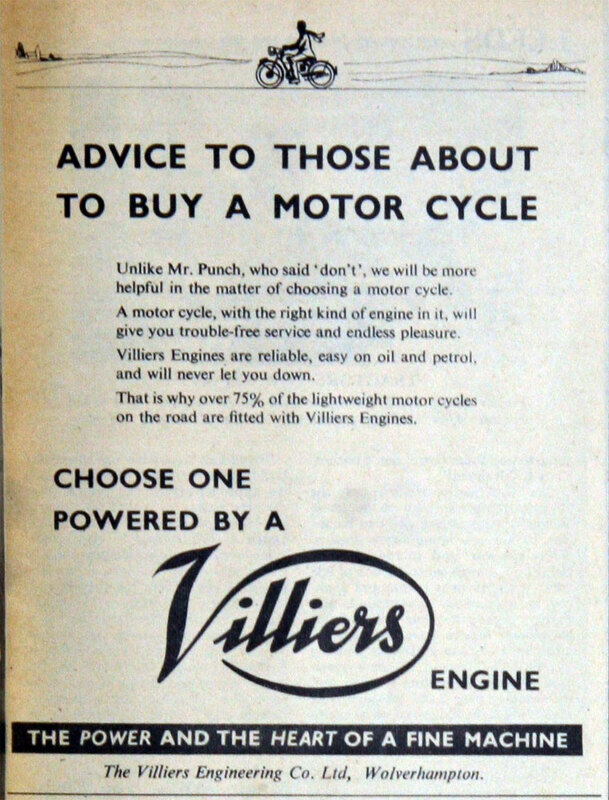 After the war, Villiers engines were supplied to: Atco Mowers, Clifford Cultivators, Howard Rotavator, Sun motorcycles, James motorcycles, Greeves motorcycles, Francis-Barnett motorcycles, Norman motorcycles, Ambassador motorcycles, DKR motorcycles, DMW motorcycles, Dot motorcycles and Panther motorcycles. 1919 Charles Marston stepped back from the day to day management of the company. He remained as Chairman but appointed Frank Farrer as Managing Director. 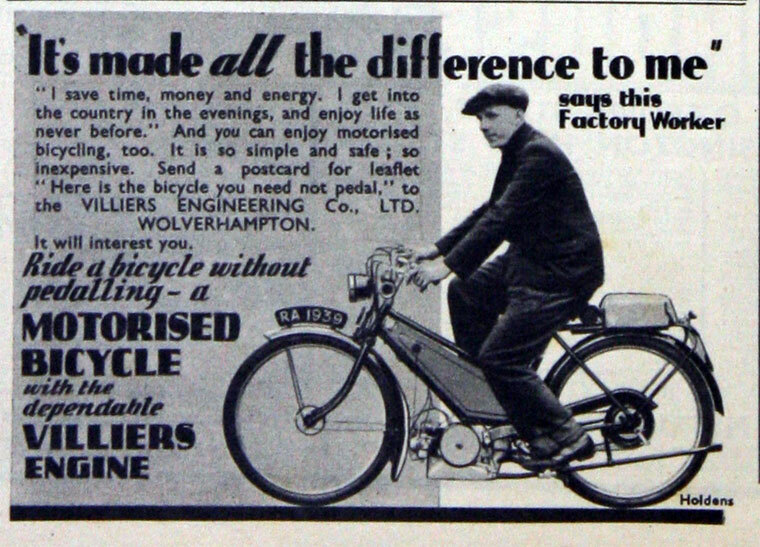 1922 They discontinued the 269cc engine and introduced a range of 147cc, , 247cc and 342cc. The three units were basically the same with the flat-fin heads now using a 'sunburst' pattern which gave better cooling. They had a single exhaust port and an intake port facing forward with the carburettor bolting directly onto the cylinder. 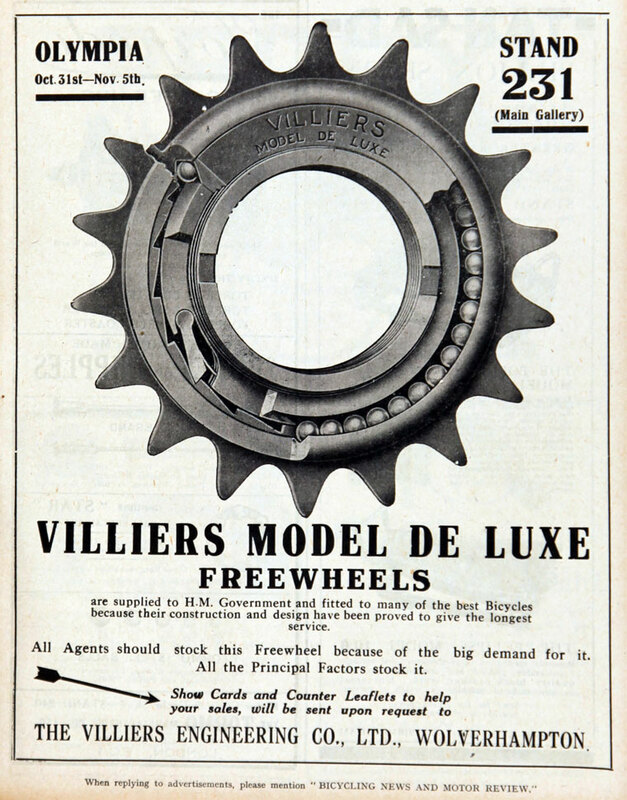 All had the flywheel magneto which included lighting coils, a 'small' magneto measuring some 7.5-inch diameter was used on the 147cc engine, with a standard 9-inch diameter on the larger engines. 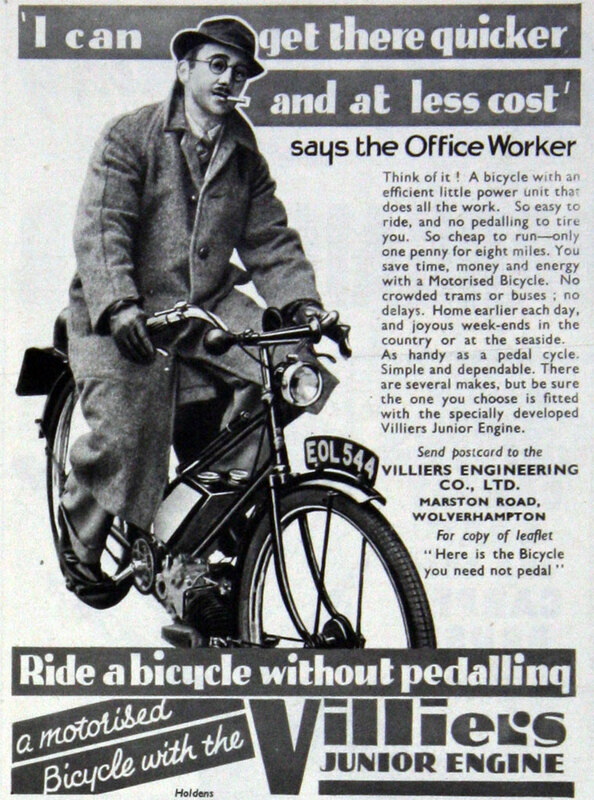 1926 Introduced the 125cc model, the Mark VI D 1.25 hp engine. 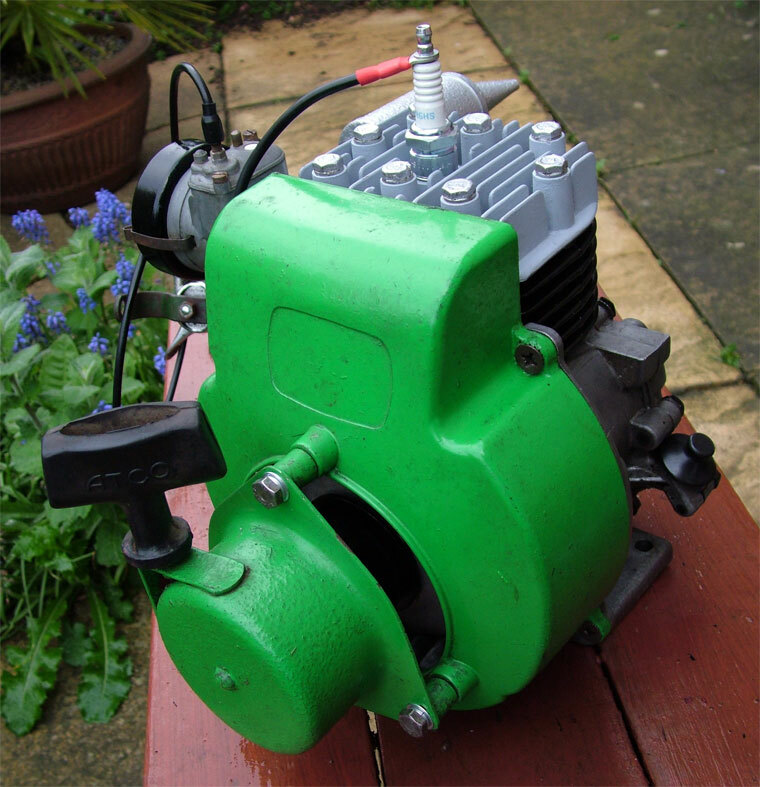 Similar to the 147cc engine having a fixed cylinder head with roller type big end, but with twin exhaust ports. 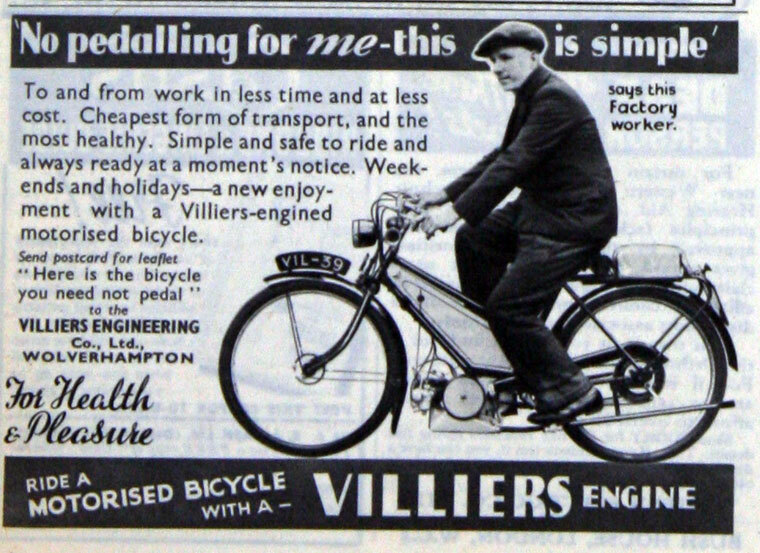 1927 Introduced the Villiers Twin of 344cc. 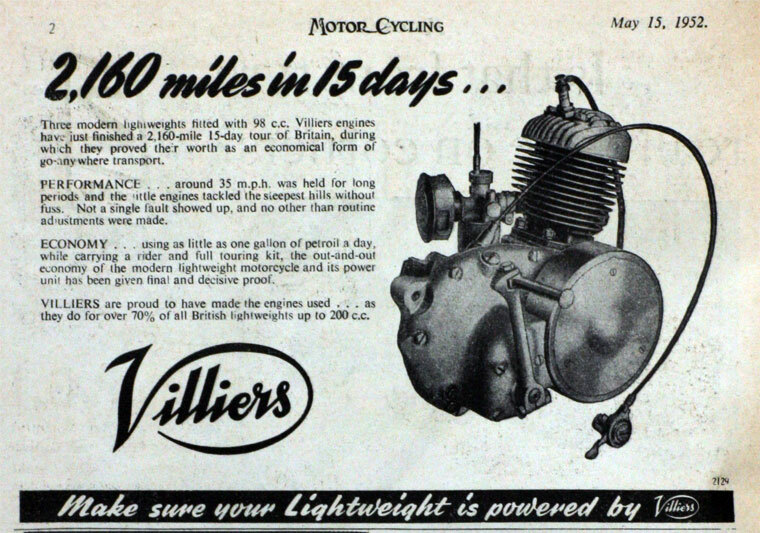 This had aluminium pistons, three large plain bearings, and was built in unit with a three speed gearbox and clutch. 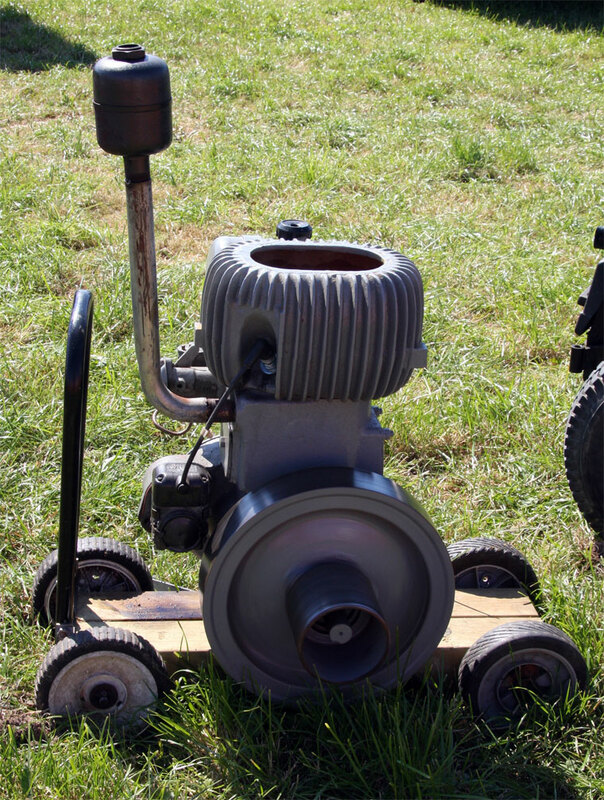 The automatic lubrication was fed from the crankcase and the flywheel magneto was placed in front of the engine. 1928 Became a Public company. 1928 Introduced the E class 196cc (later amended to 197cc). 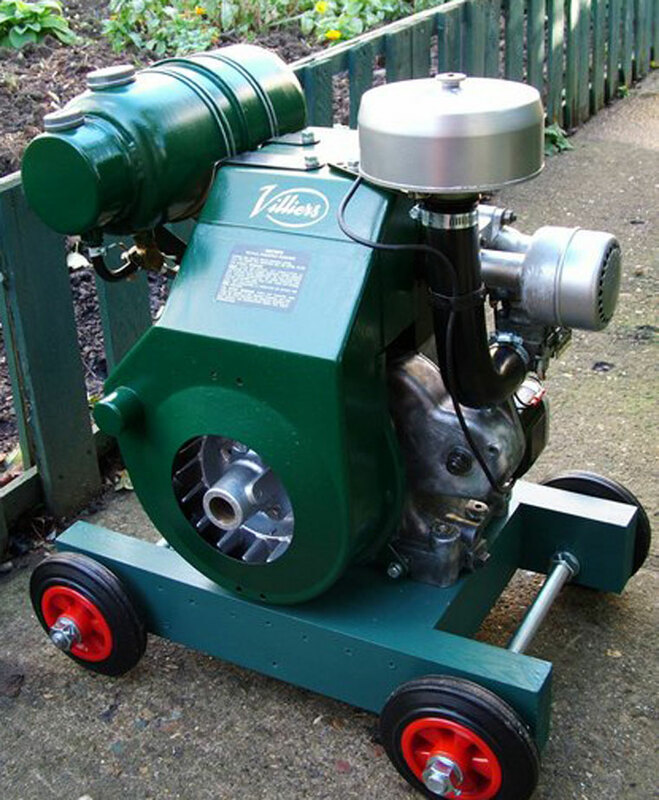 This engine was available with Autolube or Petroil lubrication and had a fixed cylinder head, a variable ignition system and a twin exhaust system, similar to the 172cc models. 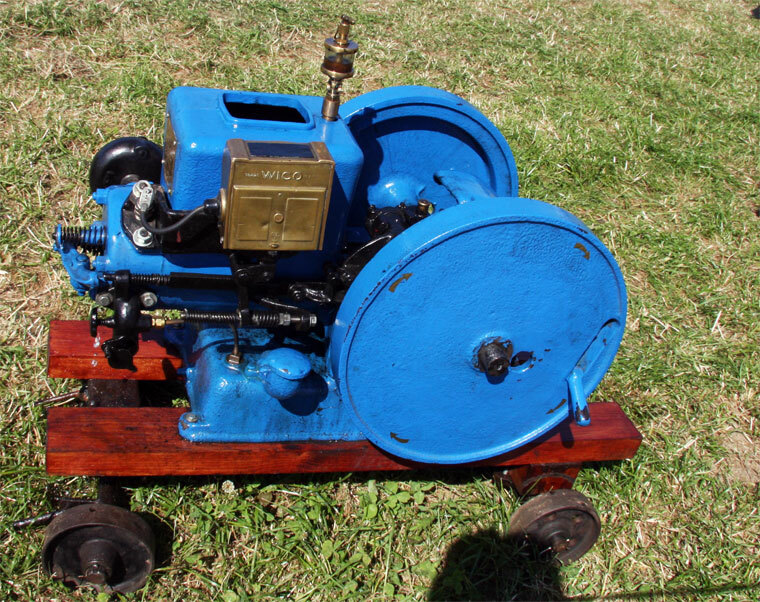 c1932 Introduced the Midget 98cc engine with the exhaust and transfer ports placed at the side of the cylinder in-line with the crankshaft and a retaining disk used to prevent the gudgeon pin entering the transfer port. The cylinder and head were cast in one piece and a cast iron deflector-type piston was used. 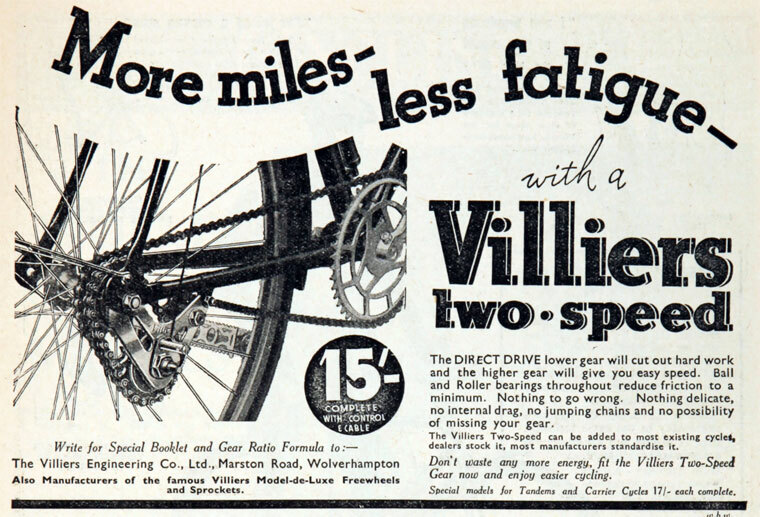 It used roller bearing big-ends and a force fit crank-pin with the cylinder upright. Petroil lubrication was used. 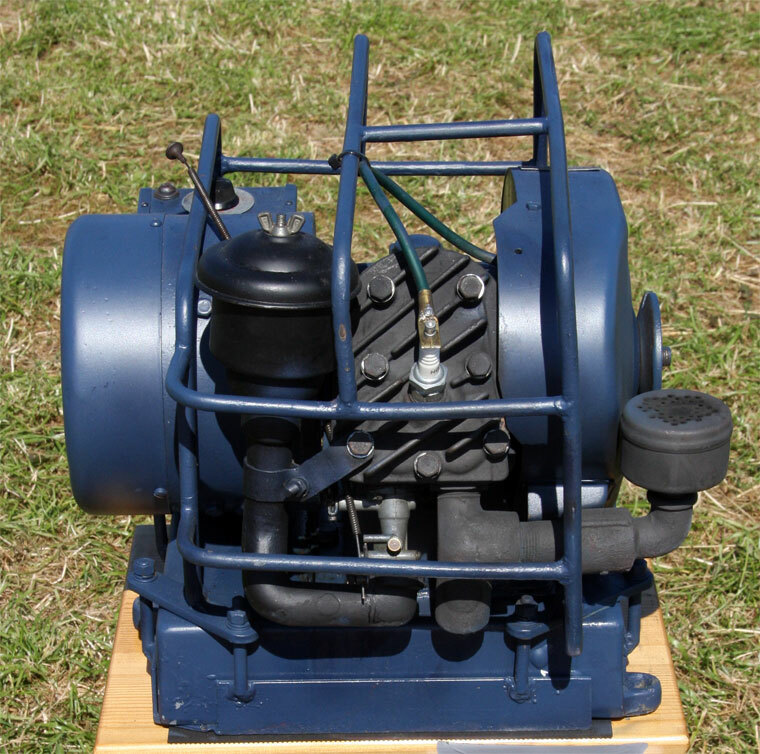 1936 Introduced the D type 122cc engine with a bore and stroke of 50×62mm. 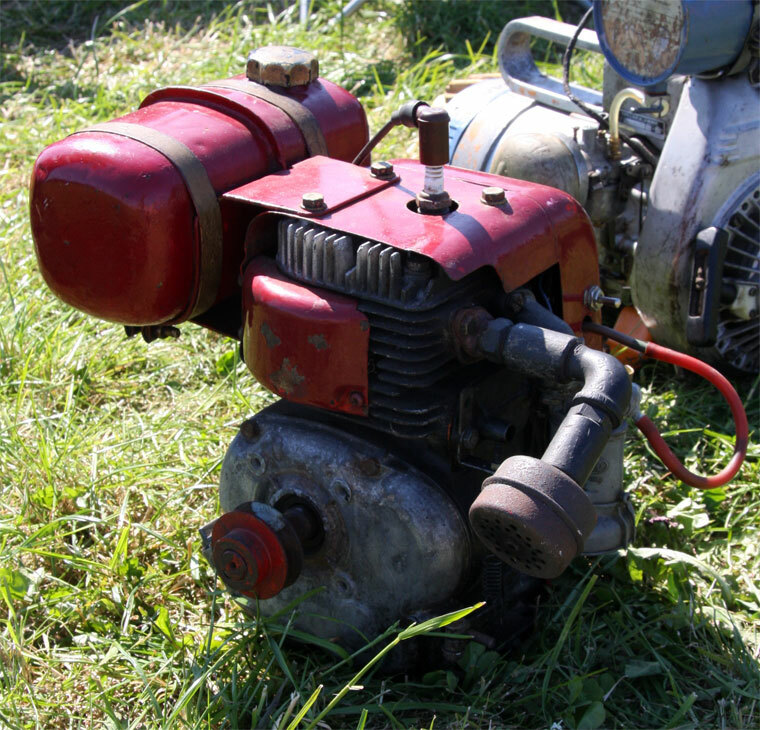 The cylinder barrel was fitted with a separate head and a flat-topped piston was used, exhaust studs were placed on both sides of the barrel and the carburettor stub on the offside. Four transfer ports were built in and roller bearings were used on the big end with the usual bronze sleeves on the main bearings. 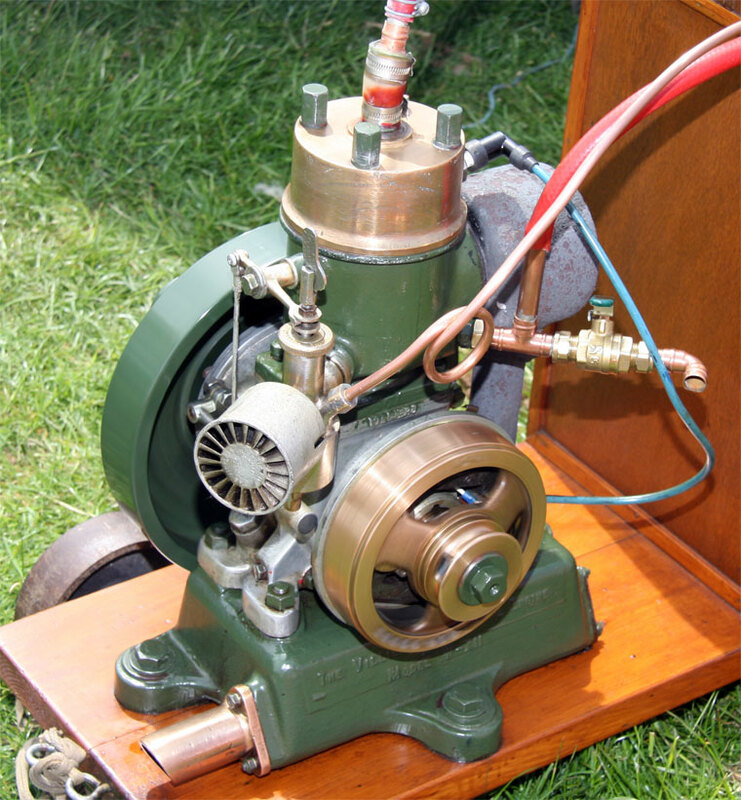 The small-end was fully floating on a bronze bush, the flywheel magneto was fitted with a two-pole system and covered by a flat alloy plate. 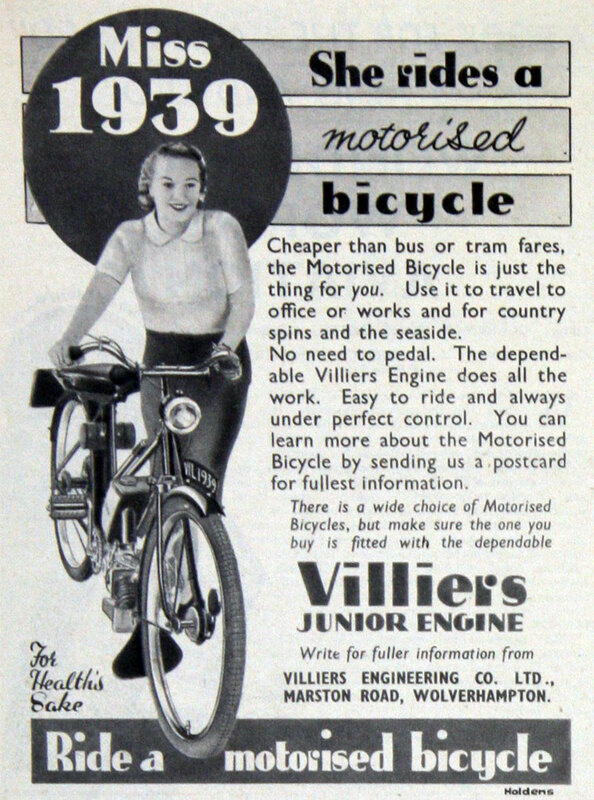 1937 Introduced the Junior 98cc engine which lay flat with the cylinder facing forward. 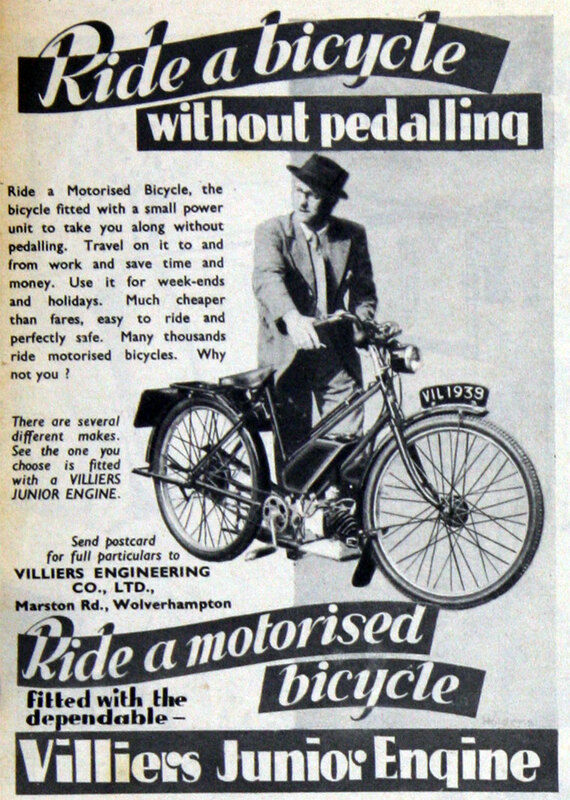 The piston was of aluminium alloy and had a deflector head. 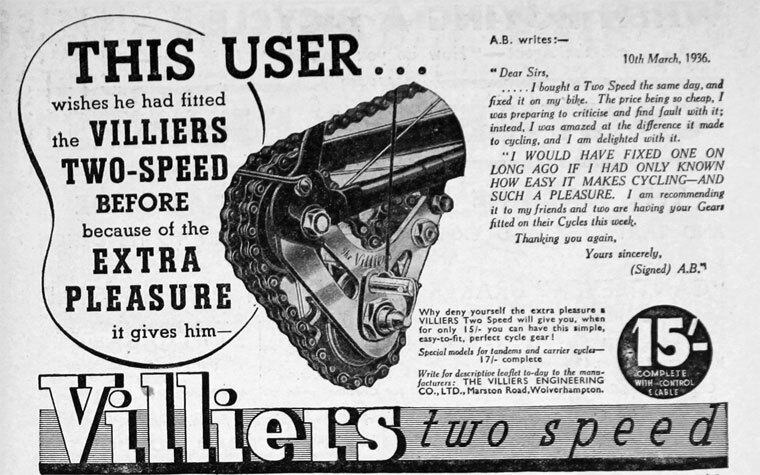 The big end had alternating steel and bronze rollers, the crankshaft mounted in ball bearings, and the crankpin overhung the casing. 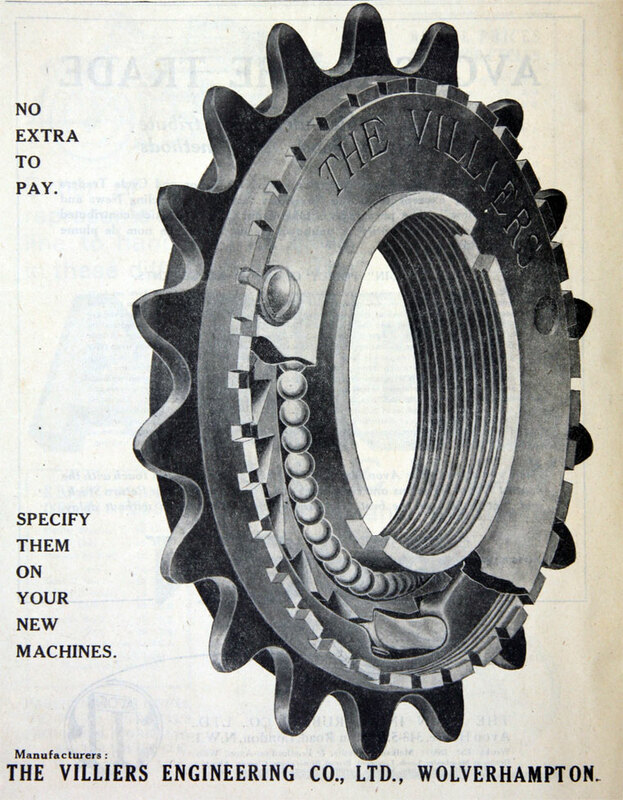 A clutch was built into the casing. 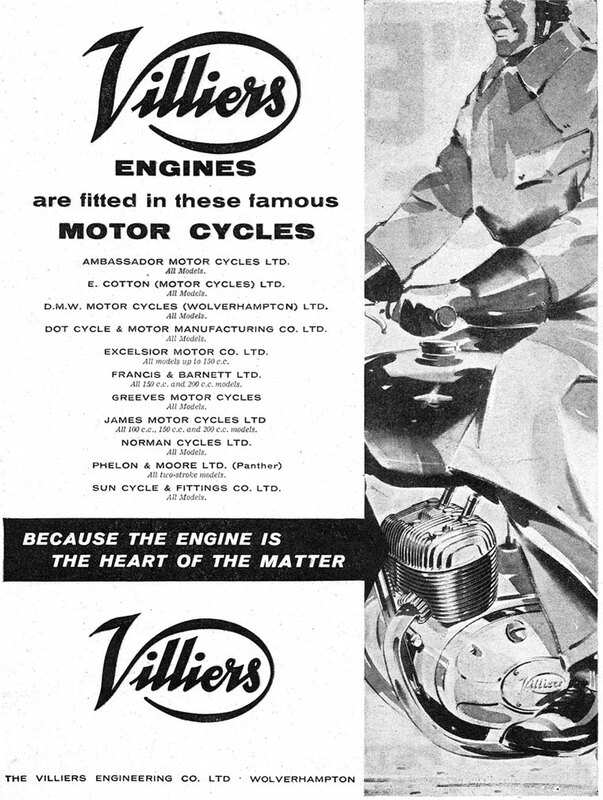 1956 Villiers produced its two millionth engine and presented it to the Science Museum in London. 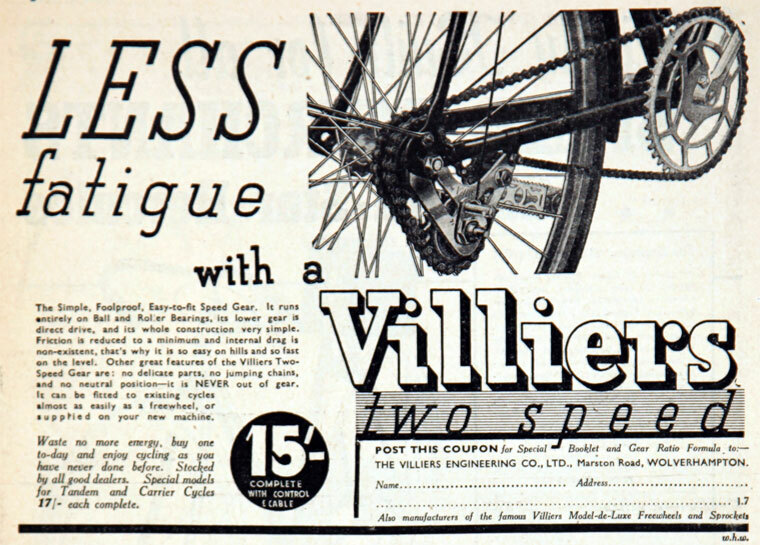 1957 Villiers absorbed J. 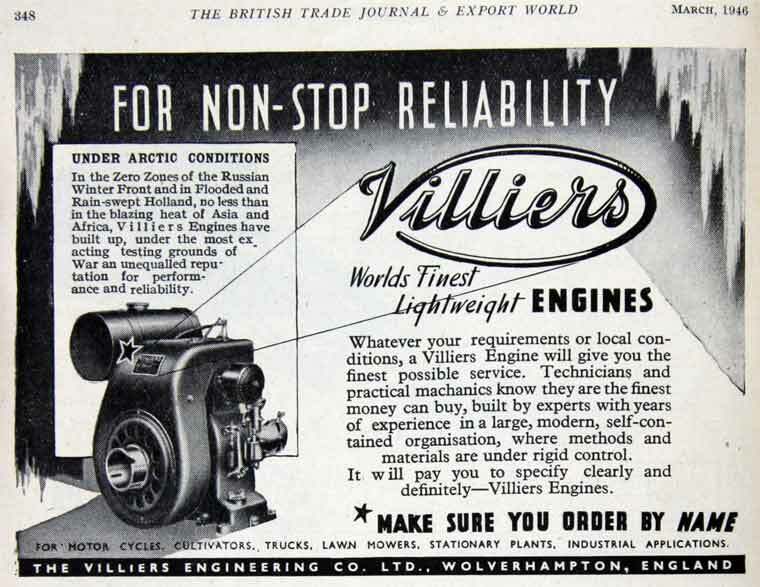 A. Prestwich Industries Ltd, makers of the JAP engines. 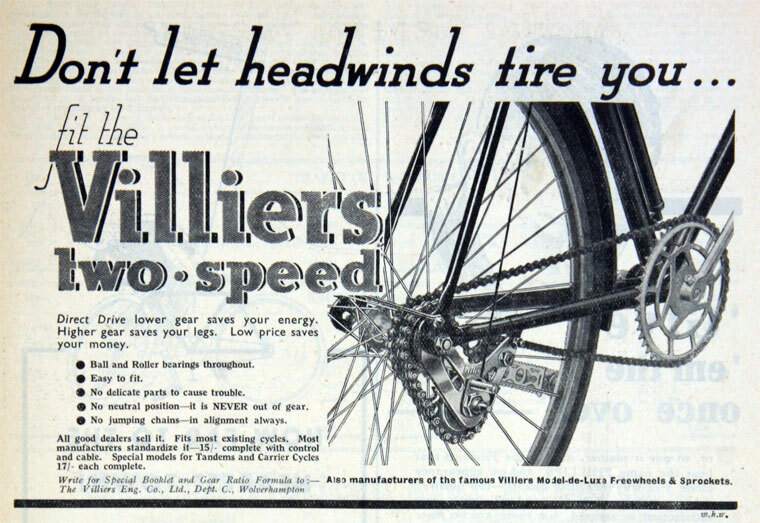 1962 The company was claiming that: "jointly, the two companies produce a vast range of two-stroke and four-stroke petrol engines and four-stroke diesel engines from 1/3rd to 16 b.h.p. 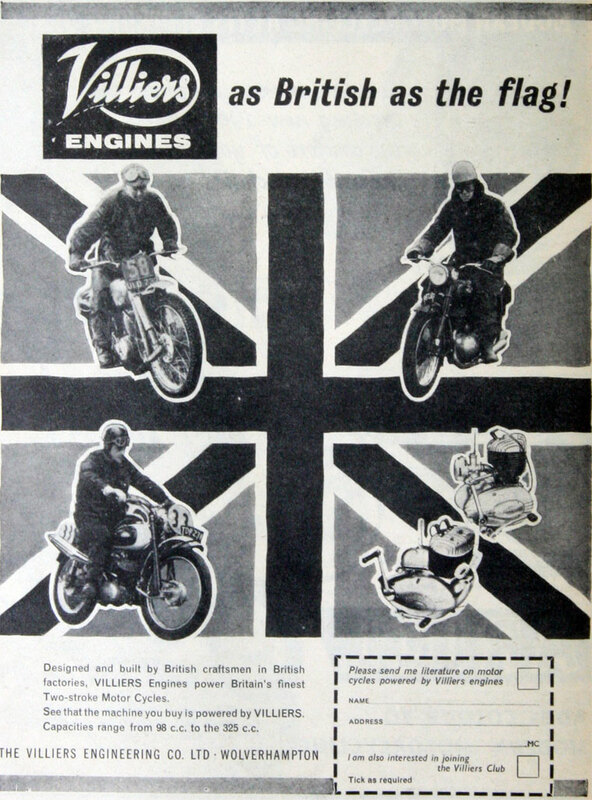 These are the engines which power many of Britain's two-stroke motorcycles, scooters and three-wheelers and the great majority of the motor mowers, cultivators, concrete mixers, generating sets, elevators, pumping sets. etc." 1965 The company was taken over by Manganese Bronze Holdings. 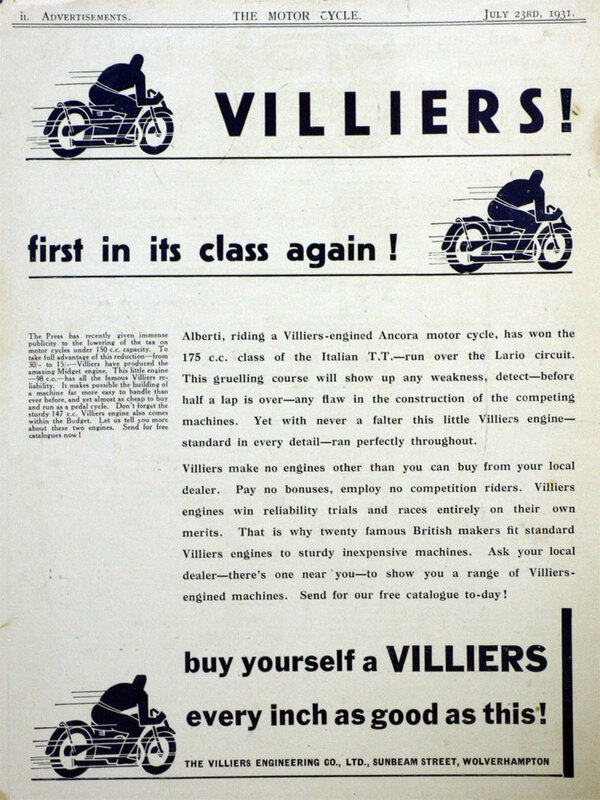 1966 Together with AMC, the company became part of Norton-Villiers. 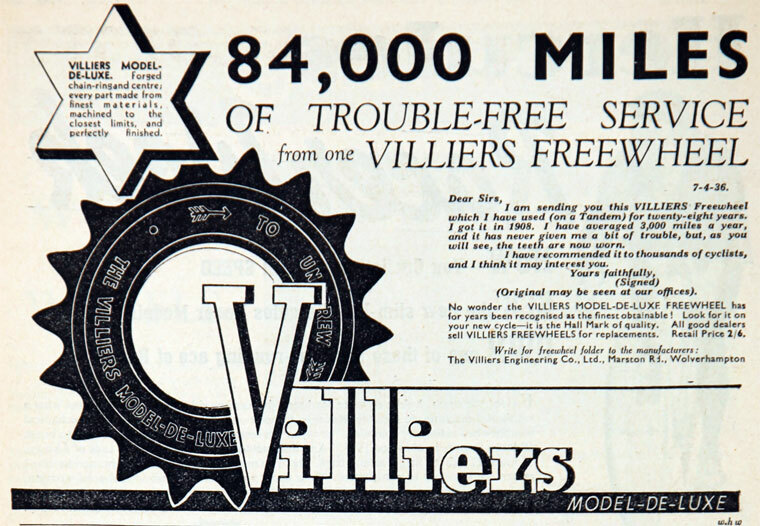 At this point, Villiers stopped supplying engines to outside companies. 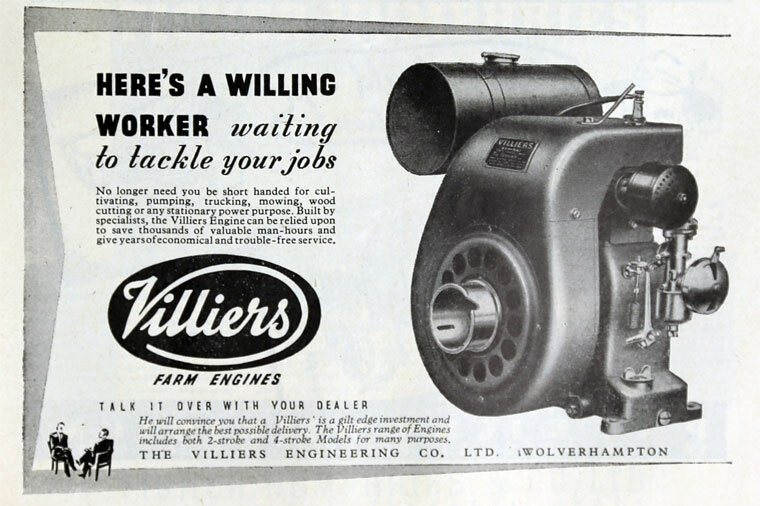 Production of the Villiers engine closed in the UK, but continued in Madras, India. 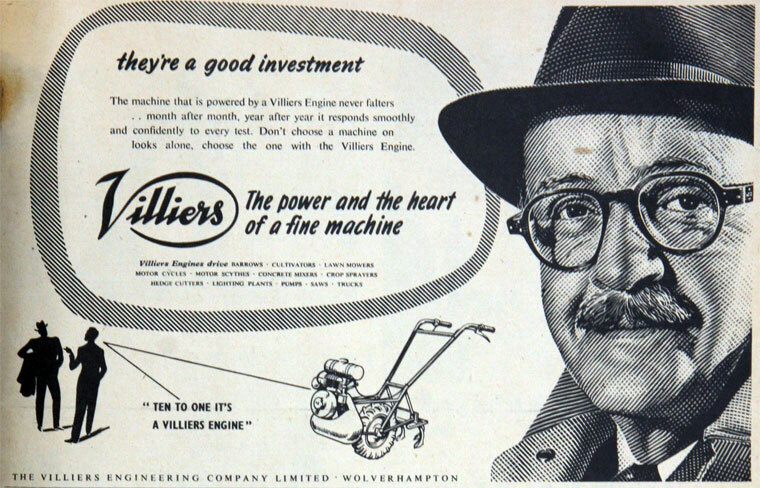 1966 Villiers Tool Development Ltd renamed Viltool Ltd at Wednesfield, Shropshire, specialising in transfer machinery for production lines; turnover had doubled in a year. 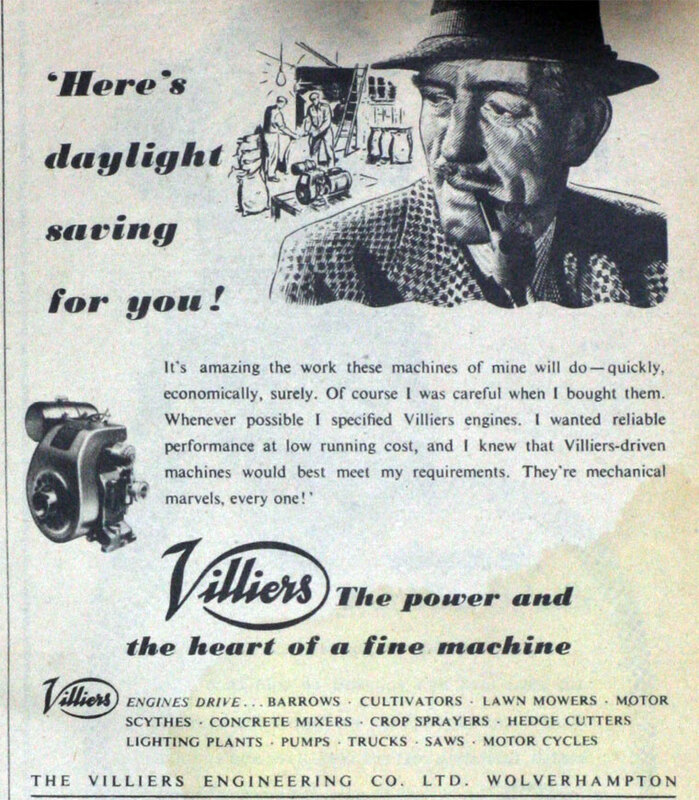 1968 Manganese Bronze Holdings sold its 70 percent interest in Viltool to the Snyder subsidiary of the Synder Corporation of the USA. 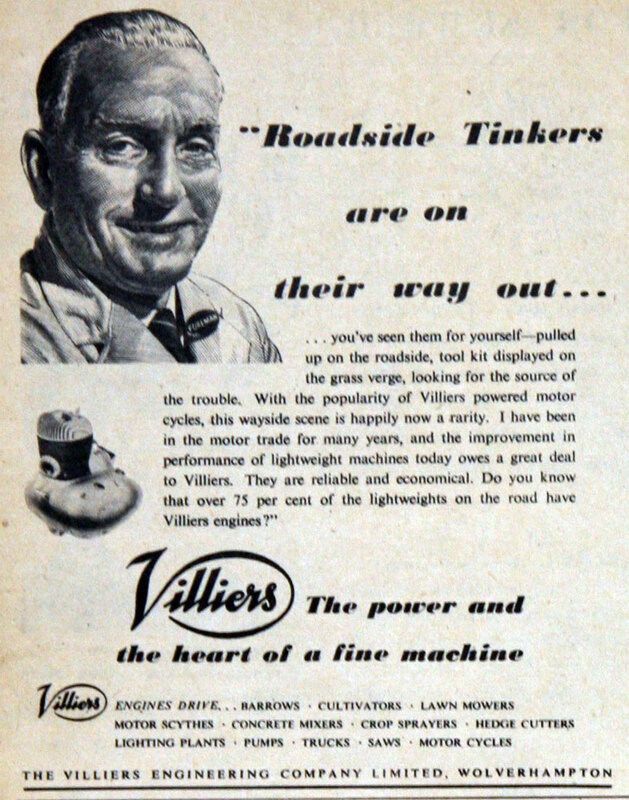 In 1999 Villiers Plc acquired the healthcare company Ultramind and renamed the company Ultrasis. Mk20. 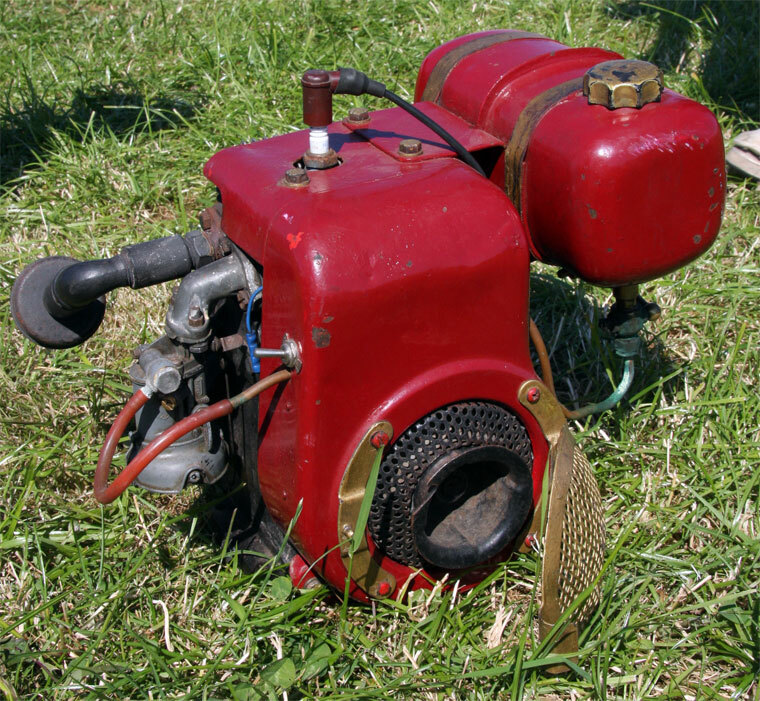 1941 Introduced the Mk20 200cc engine. This page was last edited on 22 April 2018, at 09:53.